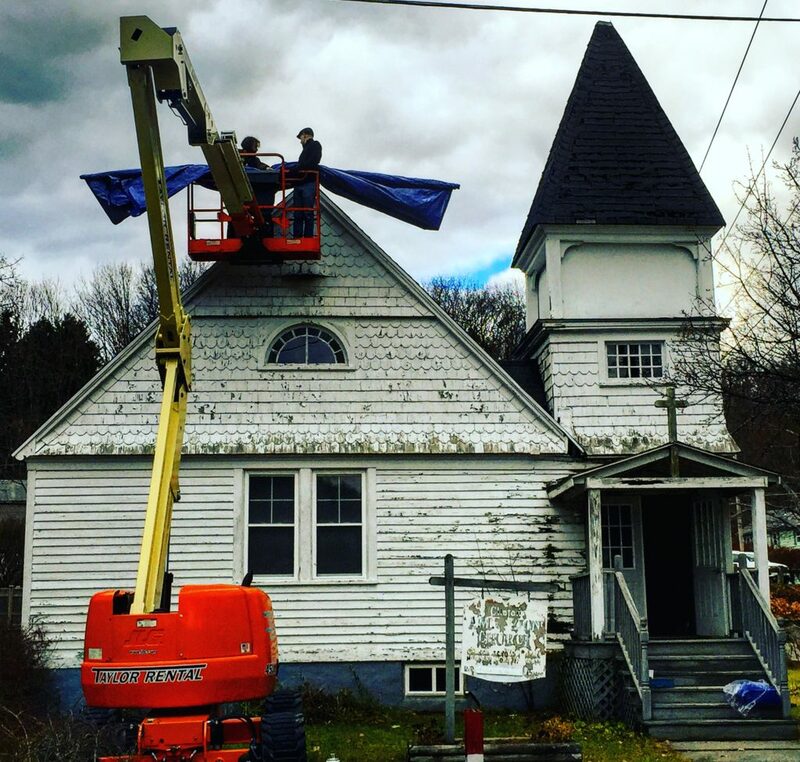 Last December, Sage Radachowsky and Steve MacLay, atop the Taylor Rental lift, get the tarp ready to protect the roof and prevent further water damage to the historic Clinton A.M.E. Zion Church in Great Barrington, the first African-American congregation in the Berkshires. Great Barrington — For obvious reasons, churches stir strong passions and create boundless energy. After all, they’re not only religious symbols but community gathering places. Such is also the case with the reuse of a place of worship that has been closed, especially when that church was the place where a future civil rights leader once worshipped. On Friday afternoon (October 6), advocates for the restoration of the Clinton A.M.E. Zion Church that scholar and civil rights pioneer W.E.B. Du Bois attended, wrapped up two days of brainstorming and workshops aimed at coming up with a detailed plan for the reuse of the downtown Clinton Church, which closed about three years ago. The upshot is three architects and design specialists presented concepts for what the repurposed church would look like. None of ideas involved radical change for the simple place of worship in the Elm Court neighborhood on the west side of Main Street behind Berkshire Bank. But all wanted to transform Clinton Church into a community gathering place that would preserve its history, honor Du Bois and retain enough space for performances and other events that might produce the revenue necessary to make the new center self-sustaining. Scroll down to the bottom of this page to view videos of the three presentations. “Even though there are some divergences here … there’s actually enough similarity on some very key pieces of how the building should work,” said Joshua Castano, senior program manager at Partners for Sacred Places, a private nonprofit that supports communities that want to save and reuse historic sacred places. Ever since a group of concerned southern Berkshire County residents formed Clinton Church Restoration (CCR) two years ago, organizers have been trying to get to this point. Earlier this year, CCR exceeded its fundraising goal of $100,000 to purchase the building and get started on its restoration. The three architects, Diego Gutierrez, Steve McAlister and Veronica Jackson, presented visions that were fairly similar. Gutierrez and McAlister, who both practice in Great Barrington, wanted to keep alterations (or what they called “interventions”) to the exterior to a minimum, while preserving much of the interior as sanctuary and so-called interpretive or museum-style space. The kitchen and banquet area would be in the basement, along with rest rooms. Click here to see Gutierrez’s concept and click here to see McAlister’s concept. Jackson’s was more interesting, but likely more expensive as well. On the north side of the building where the main entrance is, Jackson would put two “glass boxes.” One would house the main entrance and the other would house the secondary entrance that would lead to the rear of the building. Click here to see her concept. “They’re transparent boxes that literally kind of float away from the building,” said Jackson, an interpretative master planner and architecture-trained museum exhibit designer. She said the orientation of the boxes would evoke the African American history of northward migration. It’s not entirely clear whether such an alteration to the exterior would be permissible, given the building’s listing on the National Register of Historic Places. Castano said the national register does have guidelines and the secretary of the interior does have standards but most of the actual historic restrictions on the restoration would be at the local level. Local businessman and activist Bobby Houston, who has been a supporter of the project, questioned the size of the kitchen and banquet space. McAlister said phase one of the project includes stabilization of the building, roof replacement, improving drainage around the building, and “raising the building to get headroom in the basement.” He guesses that will cost around $400,000. Late last year, CCR managed to cover the leaky roof with donated tarps and other materials in order to get it through the winter. Construction started on the church in 1886 and was finished two years later. Clinton was the first African American congregation in the southern Berkshires but it closed for good in 2014. It has deteriorated ever since but the condition of the building recently took a turn for the worse after the roof on the rear addition failed, causing mold problems and structural decay. The number of closed or abandoned churches is increasing. Data from the Catholic Church alone is startling. The Catholic Church in America has seen 11 percent of its parishes close since 1988, from 19,705 to 17,483 in 2014, according to Center for Applied Research in the Apostolate (CARA), a nonprofit research center at Georgetown University. The National Catholic Register reports that new parishes are opening in the west and southwest — mostly on the strength of Latino immigration and relocations from other states. But those numbers pale in comparison to the closings. In 2013, for example, 61 new parishes opened in the United States, but 190 parishes closed. Some groups such as Partners for Sacred Places, assist churches in staying open by helping them find ways to increase revenue, or find new tenants from the arts community or area food groups. That’s pretty much what happened at Great Barrington’s St. James Place, formerly the St. James Episcopal Church at Taconic Avenue and Main Street. In 2010, St. James parishioners Fred and Sally Harris formed a nonprofit, St. James Place, Inc., and purchased the historic 150-year-old stone church to save it from demolition after a collapse of the sanctuary’s rear wall two years earlier had rendered the building uninhabitable. St. James Place, which also worked with Partners for Sacred Places, now houses a cultural and educational center and the People’s Food Pantry, which recently relocated to the basement of St. James. Just down Main Street near the intersection with Maple Avenue (routes 41 and 23) and atop a small hill sits the former First Church of Christ, Scientist. That church was bought in 2013 by McTeigue & McClelland, the upscale jewelry designers and manufacturers that subsequently relocated from a building south of downtown on Route 7 near Ward’s Nursery. The old Trinity Church in the Van Deusenville section of Great Barrington is another fine example of adaptive reuse. Legendary folk singer Arlo Guthrie bought the church where Alice Brock (of Alice’s Restaurant fame) used to live. Guthrie turned Trinity into the Guthrie Center, which houses the Guthrie Foundation and supports cultural preservation and educational achievement, as well as providing free meals each week to those who need them. Sometimes closed churches are bought and reused … as churches. The Housatonic Congregational Church was sold in 2014 to the Unitarian Universalists of South Berkshire, which was essentially homeless and holding services anywhere its congregants could find. The Unitarians used a combination of savings, loans and a capital campaign to come up with the $225,000 purchase price. Any thoughts given on the possibility of keeping the parsonage space as livable housing? Perhaps instead of just trying to fill the space for some unspecified, or very likely unnecessary reason, it could be living quarters for a caretaker/curator. Or it could be utilized as affordable housing, producing a steady income stream while not interfering with community usage of the remainder of the building. Or maybe a combination of both, where someone requiring affordable housing could also serve as a caretaker for the property. Also, while Ms. Jackson’s plan is very creative, glass boxes do not fit with the building, nor the neighborhood. And as a usage of the space, it is worth considering if the community really needs another “performance space”. What the community needs is affordable living spaces that are well maintained. It is unfortunate that the prospect of such affordable living, or even a homeless shelter was not even thought of…. Also, having watched all 3 videos…was there any mention of expected cost for any of them? I’m guessing eacheck is somewhere in the $400 – $500,00 range – significant investment for not much vision. At the CPC meeting last night the total project cost estimate was requested, and indeed it is expected to cost over a MILLION DOLLARS to meet any of these plans… $400 – 500,000 just to “stabilize” the structure, then additional for renovations. All so a building can sit vacant 80% of the time in hopes of generating income to support its maintenance. So the CCR was at the CPC meeting asking for an initial $100,000 of taxpayer money to help kickstart to process…meanwhile they are pursuing other taxpayer funding, as well as some private donations. Having had a chance to sleep on this, and the admission that they had no intention of responding to my initial comments (unless someone else spoke up too), I have to say that although I am happy that someone is doing something with this building I don’t see this as meeting any community need – there are already plenty of alternate venues for what they are proposing. A simple walk for a couple of hundred yards down Rosetter St (the next block over) will confirm that this plan does not fit this community! Having an affordable housing unit is a good idea. Valid questions Steve. Perhaps some of the CCR board members will jump onto this thread to answer. The amount of Black history in Great Barrington is falling to the wayside. I remember this church and how active it was. The Black towns people that grew up in this church, were married here and had funeral services here. I hope someone has the history written down someplace in town about how important this building was to the African American community. There is a wonderful book, published by David Levinson in 2007, “Sewing Circles, Dime Suppers, and W. E. B. Du Bois, a History of the Clinton A. M. E. Zion Church” that does just that. Plus, you might consult “African American Heritage in the Upper Housatonic Valley” (2006) edited by the same author. As they say…everybody is entitled to their opinion…….informed or not as it may be. The planners are doing it right by soliciting diverse opinions on structure and program. This is how an adaptive reuse project should work. The next dollars AKA bringing the building to life are likely to come from different sorts of donors than saved the structure.